Internet access is critical to the success of schools and colleges today. Hard copy materials are being replaced by Educational content rich in images, graphics and video. Students of all ages must research material for themselves, developing the independent browsing and learning techniques they need in today’s world. Schools in high bandwidth areas are grappling with the drive towards 1:1 pupil to computer ratios and students using their own devices on the school network. More remote schools, those using VSAT and those in developing countries are rolling out internet-enabled learning often with little and/or very costly bandwidth. Video and educational websites face slow loading times leaving the teacher frustrated and students bored. Software updates can bring the network grinding to a halt. Teachers learn to avoid bandwidth intensive content, or resort to “teaching from the front of the class”. For many schools, bandwidth is either too expensive and/or in short supply. For schools with narrow bandwidth in remote locations, a cache can make the internet usable in the classroom. In simple cost savings alone, payback is rapid and return on investment is high.Video when you need itVideo accounts for the majority of traffic in most schools, and with CACHEBOX it no longer takes forever to load.Software updates without the painWindows or Apple updates can generate huge volumes of traffic on the network, making it painfully slow for users. CACHEBOX takes all that pressure off the Internet connection. CACHEBOX works alongside third party content filters and lets you authenticate users against MS Active Directory, so you can enforce your student protection policies. You can keepa permanent record of internet requests, as well as tracking patterns and trends to aid in network planning. 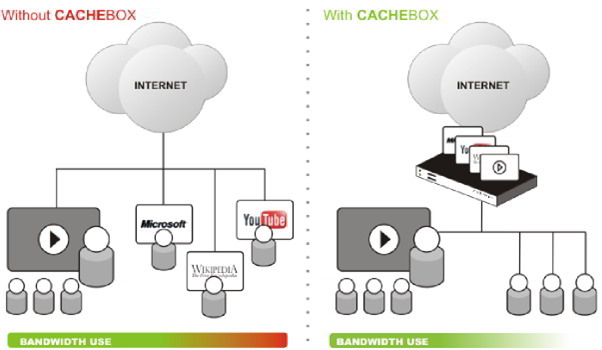 CACHEBOX has different models to fit all school / bandwidth sizes. In multi-school networks, CACHEBOXes can be deployed as appropriate across individual schools and the network core. They can work together in sibling clusters in the core and in parent-child hierarchies across the network to maximise bandwidth saving and internet performance. The CACHEBOXCMC Central Management Console makes it easy to deploy and manage multiple CACHEBOXes across an education authority.